Library service is available beyond our seven branch locations. Our outreach services go where you live and work. If you have rural mail delivery our premiere free mail-order library service might be for you. 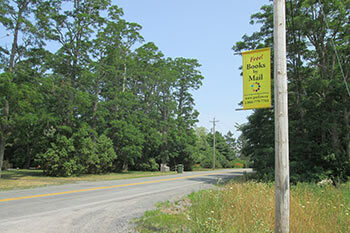 Books By Mail offers library materials delivered right to your mailbox in Pictou and Antigonish counties. And not just books but audio books, magazines, and DVDs. With subsidized mail rates, courtesy of the Government of Canada, you simply request your materials online or by phone, we mail the materials to you in a convenient pouch, and you return them by mail in the same pouch, all at no cost to you. Learn more and register for Books By Mail. By request, delivery of library materials can be arranged to residential care homes and home-bound library members. Several of the local residential care homes (Seniors Homes) do receive monthly book deposits from the library. For individual deliveries, the library can arrange to have a bag of selected books ready for a family member or a friend to pick-up, or sometimes a volunteer may be able to make the home delivery. To find out more call us toll free at 1-866-779-7761. A leisure reading collection at the Angus L. Macdonald Library, St. Francis Xavier University - brought to you in partnership with The People's Place: Antigonish Town and County Library. Academic & Public Libraries working together. To find out more call us toll free at 902-863-4276. Working in partnership with @NS Community Technology sites we offer a variety of services from help accessing online library services to computer training. Some sites also offer a selection of popular paperbacks. Locations include Arisaig, Havre Boucher, Lakevale (including a community offered book lending service), Lismore (including a community offered book lending service), Pictou Island, St. Andrews, and St. Josephs. Visit CommunityTechNS.ca for location details or call 1-866-779-7761 for more information. Class visits to the library or at your school! During your class visit, students will learn about services their local libraries have to offer including a brief orientation to the library and local branch tour. Special programs and activities can also be arranged depending on visit times and locations. Let your local library come to you! For schools that can't make it to the library, we're able to bring some of our services to you and your students. Library staff can visit your class, demonstrate some fun and exciting services we're able to offer, and sign your students up for free library cards. Introduction to 3D Printing - Allow your students to experience and explore this new technology by having our staff present an introductory session on 3D printing. Students will get to see a 3D printer in action and learn how to use some of the basic software and tools for printing their own 3D objects. Introduction to e-books and digital audiobooks - The public library offers thousands of free e-books and digital audiobooks for loan. These books can be accessed from anywhere with an internet connection and of course a library card! Teachers and Students will learn how to access the library's collection of e-books and digital audiobooks from home or in the classroom. Introduction to Family History Research - Your students will learn how to begin researching their family history using both online and print tools that you and your students can access at home, in the library and in the classroom. If you'd like to benefit from some of these services, please contact us at (902) 755-6031. During the summer and shoulder-seasons we offer a small selection of popular books (for adults and children) in a variety of locations. These are donated or withdrawn books so residents and visitors alike are welcome to take them away, enjoy them and then pass them along to a friend. Typical locations include the Caribou Ferry Terminal, Caribou Provincial Park Office, Melmerby Beach Canteen, Arisaig Lobster Interpretive Centre and at the Nova Scotia Visitor Information Centre at the Pictou Rotary. For many people with visual difficulties reading books is a challenge or not a possibility. We can help. For persons requiring a larger font we have Large Print books available in every branch library and through Books By Mail. We also offer a large selection of audio books through our website (via Overdrive), on CD, and PlayAway devices. For those with a formal diagnosis from a health practitioner we also offer a special downloadable service called NNELS (National Network for Equitable Library Service). We also provide, at no charge, various readers to assist a person use audio books complete with training. For more information please call 1-866-779-7761. Our goal is to match you with the right reading materials and the best way of accessing our services. Sometimes it requires a custom solution. We would like you to call us toll free 1-866-779-7761. We are here to help!